Hot tubs and spas are excellent outdoor accessories that offer comfort and relaxation after a tiresome day. The hot tub is a primary source of hydrotherapy which can reduce stress and other physical ailments. Earlier, hot tubs were found only in the world of commercial spas. Today, they can be installed and maintained at home quite easily. To enhance their spa experience, owners can add a plethora of parts and accessories to their hot relaxation zone. There are various add-ons which can be bought easily at affordable prices. Apart from being functional, these accessories also add an exclusive beauty to your spa. 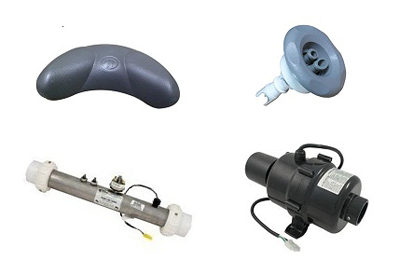 Hot tub accessories include ozone generators which ensure the purity of water. These generators treat the spa water with chemicals and keep it clean and hygienic. Water sanitation is one of the most crucial parts of spa maintenance as cozy hot tubs are often the breeding grounds of microorganisms. So, it is important to keep the water clean with a balanced pH level. Beautiful and decorative wooden steps are quite essential spa accessories as they enhance the overall appearance of the area in addition to their functional features. It is recommended that you install wooden steps which are non-slippery. They are both safe and attractive. However, the steps can be customized according to your individual comfort desires. Aromatherapy scents are important spa accessories that offer a beautiful aroma to the spa. They also create a therapeutic effect with their scented colors and rejuvenating properties. Which ones should you go for? It depends on the results you are seeking. Aromatherapy is not a new concept, but it is just now gaining awareness traction. Soft lights create a beautiful aura to the hot tub or spa. Colored lights can be installed in spa panels to create a soothing effect. They reflect and refract through the water and provide a beautiful appearance. Different colored LED lights can also be incorporated in the area for selective lighting designs. Another important accessory are towel rails theyre not just for the bathroom. Most of these rails are available with mounting brackets. The rails should be installed in the most convenient position, near to the tub, so that bathers can use it appropriately. Booster seats offer comfort to the bather. Many people find it difficult to sit on spa floors as they are quite hard and uncomfortable. The booster seats can be filled with air and are available with suction cups to keep them in place. Why be uncomfortable when you dont have to be? Water filters are quite essential to keep the water free from debris, dirt, and other contaminants. It is actually one of the most important parts of a hot tub as it ensures better, maximized jet pressure. Your filters should be replaced every six months for maximum hygiene, or more often if your situation requires it. Most of the modern units are integrated with MP3 players and wireless televisions; this is just the state of technology. Various sound systems offer an enthralling experience to the bathers.